Today I’m pleased to bring you an essay version of the panel I gave with Dr. Kathryn Hemmann of Contemporary Japanese Literature on cross-dressing in anime and manga at Sakura-Con in Seattle on April 19, 2014. Because we’re no longer limited to 70 minutes and a projector, we’re able to include more notes, resources, and a proper discussion of Ôoku, which we unfortunately had to cut short at the panel. Enjoy! Oscar Françoise de Jarjeyes: hero, soldier, noble, woman of the people. 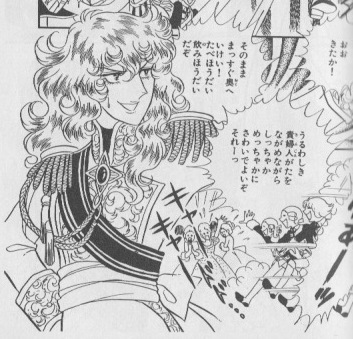 Ikeda Riyoko, The Rose of Versailles, vol. 3, p. 296. Gender bending is often cited as one of the defining themes of contemporary anime and manga, which are filled with examples of handsome women and beautiful men, not to mention cross-dressing characters who never fail to steal the spotlight. What is cross-dressing? How does it challenge and reinforce gender roles? What role has cross-dressing historically played in popular entertainment in Japan? Does a female character cross-dressing as a man mean something different than a male character cross-dressing as a woman? In this essay, we’re going to discuss ideas about gender, provide some terminology, and examine a few examples of how cross-dressing is used by characters in anime and manga as a means of exploring gender issues in contemporary Japanese society. This essay is divided into seven parts in four themes. In the first part, we’re going to outline several terms and issues related to gender fluidity. In the second part, we’ll discuss Japanese theatrical traditions, specifically those of kabuki and Takarazuka, which continue to inform contemporary popular culture in Japan. In the third part, we’ll talk about cross-dressing as it appears in comedies, romantic or otherwise, to demonstrate how laughter can both undermine and bolster personal agency in choices relating to gender identity. In the final part, we’ll move on to cross-dressing in anime and manga that are more serious in tone and content in order to explore the more transgressive and more potentially transformative aspects of gender fluidity. Content note: This essay contains minor spoilers for the anime and manga series we discuss. Although we’ll be focusing on stories and characters we love, our discussion will include issues relating to transphobia, misogyny, sexism, and bullying.